Visions of Jesus Christ.com - Elena Aiello - Stigmatist. The Holy Face of Jesus appears in blood on a wall panel next to Elena. It was damp and cold in the bedroom where the mystical phenomenon of Sister Elena occurred. A masonite panel was put on the wall to protect her from it. On Good Friday drops of blood squirted from her face onto the panel then dried up. One day after praying for St. Michael’s intercession, suddenly a flash of light appeared on the panel with more blood. Blood also soaked the coverlet close to the panel. They were astonished to see the forms of a cross, a crown and a heart form on the linen. Blood continued to flow from the panel and even though Sister Elena washed the panel with water seven times the blood continued to flow during the day especially on Feast days of Our Lord such as the Holy Cross, the Sacred Heart, the Most Precious Blood of Jesus etc. Gradually the features of a face started to appear clearer and more distinctly on the panel. It was the rough image of Jesus’ Holy Face during His Passion with blood flowing from His eyes. Many tests were made by physicians, chemists and others. All agreed it was human blood that formed the image and there was no possible human explanation for what was taking place. This phenomenon continued at intervals during the succeeding years up to Sister Elena’s death. Blessed Elena Aiello (1895-1961) - Mystic, Stigmatic, Victim Soul, Prophet & Foundress of the Minim Tertiaries of the Passion of Our Lord Jesus Christ. The information contained in this abbreviated biography was taken from the book "The Incredible Life Story of Sister Elena Aiello, The Calabrian Holy Nun (1895-1961)". Elena Aiello was born in Montalto Uffugo (Consenza), Italy on Holy Wednesday during Holy Week on April 10, 1895. Her parents were Pasquale Aiello and Teresa Paglilla. During theProcession of Rogations her mother prayed for the grace of having a baby girl and if she did, she would name her Elena and consecrate her to the Cross of Our Lord in memory of the Empress, St. Elena. Her desire to be a nun was now her goal but was forced by her father to delay it due to foreign complications which led to the 1915 World War. During this fruitful delay, she helped refugees, prisoners and nursed invalids and the dying heedless of the dangers to herself in catching any contagious illnesses. Thus began her journey on the road to a life of charity. She particularly often hurried to the bedside of the dying who refused the sacraments. One day she met a man named Alessandro, a freemason. She tried gently to persuade him to receive the Sacraments but he firmly said, “No.” She continued to plead with him and his response was to take a bottle and fling it at her. It struck her in the neck and while holding her bleeding neck with a cloth she told him that “his soul was hanging on the edge of a precipice” and that she would not leave the room until he called for a Priest to come in. Finally the freemason became so moved by her charity, that he promised her that he would receive the Sacraments on the one condition, that she herself would assist him every day. He repented, received the Sacraments from the Priest, and she cared for him for 3 months. He died a fervent Christian bearing his sufferings with patience and resignation. Her reputation for her charitable activity became so well known that she was called to the bedside of another freemason dying of cancer who was in great fear for having betrayed God by becoming a freemason in order to support his family. She helped him to prepare for the worthy reception of the Sacraments such as Confession and Communion. Her father gave his consent for her to be a religious on the condition - that she join the Sisters of the Most Precious Blood. Before entering, she was prophetically told that she would not last in this Order because God had other plans in store for her. While in the Order she was put in charge of sixteen postulants. But suffering took hold of her life almost immediately which was intestinal pain and a severe pain on the left shoulder. Eventually her shoulder became one solid black mass. She was eventually operated on without any anesthetic while holding a small wooden cross and looking at a picture of Our Lady of Sorrows. The physician, good intentioned but inept, in addition to cutting flesh also cut nerves that caused her lockjaw and a vomiting spell for 40 days. Despite the pain, Elena’s intent was to take part in the upcoming religious clothing ceremony through sheer will-power but when the Father Director saw her in such a deplorable state, he couldn’t let her go through with it. What she feared would happen, did, she was asked to leave the convent and return home. However, Elena wrote in her notebook that Our Lord asked her on two occasions to accept His own designs with complete resignation and embrace His cross. Elena left in tears not realizing the great esteem in which she was held by everyone when they observed her good-nature and patience in suffering. Elena’s shoulder was getting worse. In fact, the doctor told her that gangrene was already setting in. The doctor advised her father to demand compensation from the Institute, in other words, sue them. But Elena pleaded with her father to do nothing of the kind especially since she also had hopes to return to it. Her long period of suffering began and her dream of being a sister was fading away since now she couldn’t even retain liquid food. The doctor diagnosed her with stomach cancer and told her there was no cure and that she was going to die. Her characteristic frank response to him was, “My dear doctor, it is you, who are going to die: I will not die from this disease, because St. Rita is going to make me well”. On the way home, Elena stopped in a church where St. Rita was venerated to beg her for a cure. In her notebook she writes that she saw dazzling flames all around the statue and told her cousin who was next to her. Her cousin didn’t see anything. Then that night she had a dream of St. Rita who told her that she wanted devotional exercises to be held in Montalto in her honor in order to rekindle the faith of the people. You see, the saints do not want honor for themselves but always for the glory of God. Elena started a triduum and St. Rita told her to say a second one and that she would be cured but the pain in her shoulder would remain because she had to suffer for the sins of the world. Elena’s confessor and spiritual director carefully documented all of these facts. In the process of trying to fulfill her promises to St. Rita, she experienced other spiritual phenomena. She told her confessor that Our Lord frequently admonished her to accept a new way of suffering and that He said “You are going to suffer. But fear not. Yours shall not be a malady but only the symbol of charity. I shall permit you to experience My very sadness and on Friday you will be more united to Me.” During that winter she attended a Passionist retreat which appealed to her because she was drawn to the Passion of Our Lord. She disclosed some of the instructions from Our Lord and St. Rita to the priest who gave the retreat and he enlightened and encouraged her. As more of the news of what was happening to Elena spread, people began to discuss differing opinions about them. During this time, an extraordinary event took place which caused Elena to be known to many people far and wide. This phenomenon was to occur every year until her death. One day, a family servant named Rosaria was about to leave the house when she heard wailing from Elena’s room. When she went into the room she saw Elena covered in blood and thoughtthat someone had killed Elena. She ran to tell the family. The family, on seeing so much blood but Elena still alive, called the Doctors and several Priests. Upon arriving, the doctor tried to stop the blood, but it kept oozing out of her head. Then at last, after three hours it suddenly stopped. Everyone was confused and badly shaken. The next Friday the doctor came again and saw the exact same thing take place. Her Confessor thinking it might be religious obsession took her Crucifix away from her and forbade her to read any books about the Passion of Jesus. Despite this it occurred again. The mother, at the request of her son a doctor, came to visit Elena and wiped some blood from her forehead with a handkerchief. She folded it because she thought it was contagious and presented it to him so for examination. When the doctor opened it, the handkerchief was completely clean and the doctor converted and was baptized as a result. About five o’clock Jesus greeted her: “My child, behold how much I suffer. I have shed all my blood for the world and yet everything goes to ruin. Nobody pays any attention to its countless crimes. See how bitterly I suffer for the wrongs and contempt I receive from so many wicked and immoral people.” Elena replied: “And what can I do, my Jesus? Unless You come in person, no one will believe me.” Jesus replied: “There are so many sinners whose obstinacy is the determinant cause for My Justice. But, my child, don’t feel discouraged, because you will see Me again about one o’clock, and tell your Confessor I will give him a sign on Friday at 2 o’clock.” Having said this, He disappeared. Her Confessor finally became convinced that the mystical phenomena was from Our Lord. All of the extraordinary activity didn’t interfere with her duties as the new Foundress and Superior General of a new Religious Community. No one was permitted to view her Good Friday agony out of curiosity and on Holy Saturday, she resumed her work and responsibilities as if nothing happened to her. In addition to her physical sufferings she endured the bitter experience of humiliation because people kept calling on “the holy nun who sweats blood” to help them with their important business decisions. Several times Elena foretold that she was going to be cured of the painful wound on her shoulder. She told her Confessor, “…Jesus appeared to me saying: “My beloved daughter, do you wish to get well or to go on suffering?” “My Jesus,” I replied, “one feels so good when suffering with You. However, do whatever You wish.” “Well,” Jesus went on, “You shall recover, but I want you to know that every Friday I shall permit you to be in a state of depression, so that you may stay closer to Me.” So saying, He disappeared. One day she was being helped to pull out the worms from her shoulder wound with splinters. She endured the torture with great faith in St. Rita who she believed, without a doubt, wouldcure her. But few people could believe it with her; after all she suffered this for three long years. Elena eventually would meet a woman named Gigia who had come to seek her advice about a religious vocation. She too had been discharged from an order because of an illness. They talked and become close and Elena realized that Gigia would be called to assist her in the charitable work she was beginning. At first Gigia was doubtful that Elena, an invalid herself would even be capable to help others. It is not clear exactly when Elena officially became as religious sister but from this point on we refer to Elena as Sister Elena. Sister Elena and Sister Gigia settled into their new house. They began their apostolate which was to offer religious instruction to the children in their district who had been neglected. Their zeal was great to extend their work everywhere and so one day Sister Elena went into a protestant church assembly and in the presence of the minister exhorted the people to return to the Catholic Church. They sisters’ zeal resulted in having sinful marriages validated, children baptized and older people were helped to finally receive Holy Communion.Together they succeeded in converting a 14--old rascal who was reputed to be known as “Ciccio the Thief” to become converted, live a fervent life and to die a holy death at a young age. Their work was developing so rapidly that they were forced to look for a new home. The sufferings of Sister Elena continued and Sister Gigia had no choice but to lock Sister Elena in the attic at times to keep her away from the attention of the people who knew about her extraordinary happenings. Even the police, after pleading with the Archbishop, were not permitted entry. It was suggested to the nuns that it might be to their advantage to move to another larger house. The house was poor and only had one piece of furniture. The number of little orphans climbed to 26 and two more aspirants came to the order. A woman doctor demanded that an investigation be made of the “woman with TB who was boarding old people and little abandoned girls”. Upon examination of the situation, the accusations were found to be without warrant and completely false. One time St. Therese of the Infant Jesus appeared to several of the little ones who were praying while sewing in the work room. Sister Elena rushed downstairs to the shouts, “We have seen the Carmelite Saint!” Upon arriving, Sister Elena too saw the saint smiling at her. Sister Elena was at the time reciting the Office of the Blessed Virgin from the second page of her prayer book. Suddenly she spotted a 50 lire bill between the prayer card of Our Lady of Sorrows and that of St. Teresa. She was positive that nothing of the kind had previously been in her prayer book as she had re­cited the very same prayer, on that very same page, on the previ­ous evening Anyway, after Mass and after handing the 50 lire bill for the day's needs, Sister Elena with all the girls went back to the Chapel, and there within earshot, she prayed to God to let her find another 50 lire in her prayer book at the same place as an unquestionable proof that the first 50 lire had not been forgotten by someone, but that they were actually the gift of Divine Provi­dence. During the day, some of the bigger girls and even one or two of the Sisters went searching through that prayer book which had been left at its place. In the evening, when the Community assembled in the Chapel for the evening prayers, while the "Con­fiteor" was being recited, the same kind of a fragrance as in the morning was felt. Elena got greatly excited. 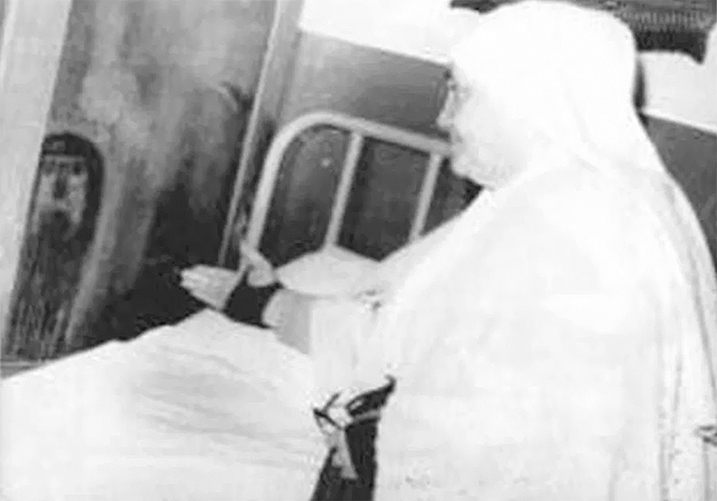 She didn't dare open her prayer book, but passed it on to Sister Teresa to do so. Sister obeyed and there were the additional 50 lire between the two prayer cards, at the same place. In the white circle there was a green handwriting, 50 + 50 = 100 with some letters of the Greek alphabet. The following morning Elena related the incident to her Confessor, Canon Mazzuca, who insisted on looking at the 50 lire banknotes-No. 01670 and 0039. However, the inscription on the white circle had completely disappeared. Father Benjamin Mazza, who wished to retain those banknotes, exchanged them with one for 100 lire, which is now in the possession of Blessed Elena’s Community. A man was peddling cheese as usual and was accompanied by his little daughter who was in rags and forced her to go begging through the town. One day this scoundrel was just about to sell his own daughter for 30 lire when Sister Elena overheard them bargaining and notified the Counselor across the street to ask for his help. The two bargaining men suddenly vanished leaving the little girl alone. Sister Elena promptly took her home and was ordered by the district attorney to keep the girl despite any possible protest from her father which in fact did happen when he tried to forcibly abduct the little girl. Sister Elena however was successful in wresting her from his hands. The sisters endured many trials which is the lot of all saints-in-the-making. Once again Sister Elena dreamed of her house being quarantined during an epidemic and it happened. However, everyone was eventually able to return to the house and resume their routine work. Sister Elena’s order admitted more aspirants and after having gone to Rome she obtained the necessary approvals for her Order according to the steps required for the process. Her sufferings increased with greater intensity. During that time people succeeded in getting into Elena’s room to uncover her “occult powers”, “diabolical plots”, and “fake events”. People, the kind you never find inside a church or never praying before the altar, often met in the sacristies for the sole purpose of spreading gossip and detraction to try and belittle her Institute and to connect her to some sad incidents that had caused pain to the Monsignor and Archbishop. The Archbishop advised Sister Elena to file a lawsuit against the lead defamer. But the defamer made a full confession to the Archbishop and asked for Sister Elena’s forgiveness who withdrew the lawsuit. However, afterward another Shepherd was confronted with more grievances and accusations against that “encroaching Nun who loved to pass as a saint and preyed on the people’s good faith to the harm of other Institutes as well as by her phenomena by the distribution of St. Rita’s concoctions and by her subterfuge of so-called girls’ welfare”. The Archbishop listened benevolently to Sister Elena and decisively put an end to the stealthy maneuvers and upheld the rights of truth and justice. Divine Providence always came to the aid of Sister Elena who often did not have the money to pay for things. She humbled herself and sought help from benevolent persons and begged of her creditors to be patient and understanding. One time the electricity was cut off due to lack of employment. Elena went to the company’s office and asked for understanding and the director ordered the current to be restored with an order that Sister Elena “was not to be disturbed” anymore due to lack of payment. Another time they prayed to the great saint St. Joseph for assistance; for a payment was due for some oil. The exact amount arrived needed to pay for the oil. On another day bread was needed for the Institute. It was suggested to sister to buy it on credit. Sister already had credit on the books for a long time and didn’t have the courage to do it. She came home empty handed. At mealtime there was no bread and so she prayed. Suddenly there was a knock at the door. A municipal guard delivered 36 kilograms of bread to them that had been picked up as a result of a violation that morning. On another occasion the little orphans told her that pasta was the only food in the kitchen. Sister Elena caressed them and led them to the chapel saying, “Just pray and you will see that God will provide.” Within a few minutes Sister Elena was sent for because the City Questor had just brought in 18 kilograms of fish. On the way back to the Institute, Sister Elena told the officer the story who was amazed and even more so when he saw the little orphans in the chapel still praying for the same intention. In 1940, Sister Elena was directed by Our Lord to take a more public role and to deliver a message to Premier Benito Mussolini, telling him not to join with Hitler in World War II. Otherwise, Italy would suffer a terrible defeat and Mussolini would be punished by Divine Justice and have a speedy downfall. But he ignored the warning, and all that was foretold came to pass. This letter was delivered on MAY 6, 1940 to the Duce's sister, Donna Edvige who handed it to Mussolini. “The world is going to ruin because of its many sins, particularly the sins of impurity, which have presently exceeded the very limits before the Justice of My Heavenly father. Therefore, you shall suffer and shall become an atoning victim for the world, especially for Italy where My Vicar on earth resides. My Kingdom is a Kingdom of peace: whereas the whole world is entangled in war. The Nations’ Rulers are bent on acquiring new possessions: Poor fools! They don’t know that, when there is no God, there is no victory either. Their hearts are filled with wickedness. All they do is to outrage, ridicule and despise Me. They are like devils sowing dissension, subverting people and seeking to drive into the sinful scourge of war even Italy, where God is pleased with many souls, and where My Vicar on earth, the Pastor Angelicas, resides. France, so dear to My Heart, shall soon fall to ruin on account of her many sins, and shall be overthrown and ravaged like the ungrateful Jerusalem. I sent Benito Mussolini to preserve Italy from the precipice because of My Vicar on earth: otherwise, by now, she would be worse off than Russia”. “I have always shielded him from many dangers. He must now keep Italy out of war, because Italy is a civilized country and it is the dwelling place of My Vicar on earth. If he is willing to do this, he shall receive many favors and I shall make all Nations respect him. But since he has made up his mind to go to war, tell him that, if he doesn’t prevent it, he will be punished by My Divine Justice”. “You may have thought that, on account of my long silence, I may have forgotten you, whereas I remember you every day in my prayers. I am following the painful events now taking place in our beautiful Italy. We have left Cosenza on account of the bombardments. The enemy’s barbarity has vented all its hatred by bombing the City of Cosenza thus bringing desolation and death to the population. I was bedridden because of my illness: three bombs fell close to our Institute, but the Lord, in His infinite goodness and mercy, has protected us. We have taken refuge at Montalto Uffugo, my native town, in order to protect the little girls from the danger of new raids. Ah! Had the duce only listened to Jesus’ words, Italy wouldn’t be in such a terrible plight now…I know that the Duce must feel quite dejected on seeing Italy, once a flourishing garden, now a barren field filled with diseases and deaths. But, why persist in this terribly cruel ward, when Jesus has stated that no one is going to achieve true victory? Therefore, my dear Donna Edvige, please tell the Duce, in my name, that this is God’s last warning to him. He is still in time to save himself by leaving all things in the hands of the Holy Father. Should be unwilling to do so – said the Lord – divine Justice shall quickly reach him. The other rulers also, who play deaf to the counsel and directives of My Vicar, shall be overtaken and punished by My Justice. Do you recall that, on July 7th of last year, you asked me what was in store for the Duce? Didn’t I reply that, if he didn’t listen to the Pope, he would wind up worse than Napoleon? Now I am going to repeat the very same words, “If the Duce is unwilling to rescue Italy and ignore the Holy Father, he will have a speedy downfall.” Even Bruno is begging his father from the other world to save both Italy and himself. Quite often Our Lord says that Italy will be protected on account of the Pope, who is the atoning victim for this disaster. Therefore, the only way to achieve true peace in the world is the one that the Holy Father shall indicate. somehow counteract the evil done provided he be willing to do what God wants of him. As for me I shall continue to pray for that intention. The losses during the war and bombardments were heavy. Many of the sewing and knitting machines that the orphan girls were trained to use and had won prizes at several exhibitions were destroyed in the war. The reconstruction period was slow but benefactors helped by making generous donations. One day Sister Elena was crossing the street with a little girl and was hit by a bus barely saving the little girl. Sister sustained several fractures and could hardly stand and was in a great deal of pain. She was unable to retain any food again but longed for Holy Communion daily. She wasn’t able to get to the Mass chapel and had to have communion brought to her. On feast days Mass was celebrated in her cell. She continued to conduct the business of the house from her bed dictating letters and responding to correspondence from all over Italy and even North America. Many people begged for her prayers and sought advice. She was particularly noted for her charity in her letters that brought consolation to the downhearted. She was always available to all those who came to see her about the important business of the Institute or who were seeking relief in their trials or hopeless situation. When people ran to her when in misfortune, like a good mother, she never minded the time: she aimed only at preparing people to accept suffering and misfortune in a spirit of resignation to the loving Will of God. She knew how to listen and when to speak. She was a truly compassionate soul. She kindled the flame of resignation and hope in anguished souls. Many families also believed that she acted as a lightening rod for their safety, so great was theirconfidence in her. Sister confided to her director that she had visits at night from faithful departed souls who had association with her and the Institute. One time the door of sister’s cell blasted open with a loud explosion that was heard by everyone. When they rushed upstairs Sister told them it was just Father P.D. who had come up to thank her and the community for the fervent prayers said for the repose of his soul. “The powers of evil are getting ready to strike furiously in every part of the globe. Tragic events are in store for the future. For quite a while, and in many a way, I have warned the world. The nation’s rulers do indeed understand the gravity of these dangers, but they refuse to acknowledge that it is necessary for all people to practice a truly Christian life to counteract that scourge. Oh, what torture I feel in my heart, on beholding mankind so engrossed in all kinds of things and completely ignoring the most important duty of their reconciliation with God. The time is not far off now when the whole world shall be greatly disturbed. A great deal of blood of just and innocent people as well as saintly priests will be poured out. The Church shall suffer very much and hatred will be at its very peak”. “Italy shall be humiliated and purged in her blood. She shall suffer very much indeed on account of the multitude of sins committed in this privileged nation, the abode of the Vicar of Christ”. “You cannot possibly imagine what is going to happen. A great revolution shall break out and the streets shall be stained with blood. The Pope’s sufferings on this occasion may well be compared to the agony that will shorten his pilgrimage on earth. His successor shall pilot the boat during the storm. But the punishment of the wicked shall not be slow. That will be an exceedingly dreadful day. The earth shall quake so violently as to scare all mankind. And so, the wicked shall perish according to the inexorably severity of Divine Justice. If possible, publish this message throughout the world, and admonish all the people to do penance and to return right away to God”. She acted toward God with complete surrender, childlike abandon and spoke with sincerity, candor and simplicity. She denounced injustice and exploiters even at the cost of humiliations and misunderstandings. She was a strong woman of the Baptist and Catherine type. She kept her rosary beads wrapped around her wrists so as to be able to say it at any free moment. She kept the church beautiful with fresh flowers and observed the solemnities and sacred functions with fervor. The only thing she really dreaded and abhorred was the evil of sin which she fought wherever she found it. She had a motherly compassion for sinners and for their salvation and never spared prayers tears or pains. In her houses even during working hours, the Holy Rosary and other prayers were frequently said and everyone directed their work to and kept in the continual presence of God. Finally it should be noted that Sister Elena fasted daily on a diet of vegetables and water but was always able to fulfill her duties with a robust constitution in spite of her sufferings. In April 2011, Pope Benedict XVI approved the petition allowing for the Beatification of Venerable Elena Aiello. She was declared Blessed on September 14, 2011.